The National Retail Federation's Annual Convention & EXPO earned the nickname "Retail's BIG Show" years ago and because the name was so appropriate, it stuck. 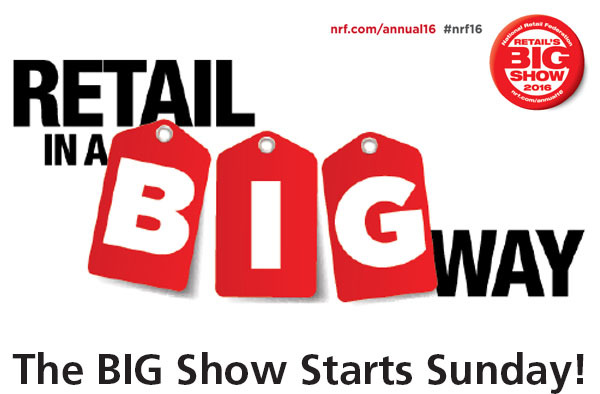 Retailers and retail industry thought-leaders will gather in New York City next week for Retail's BIG Show 2016, taking place Jan. 17-20 at the Jacob K. Javits Convention Center. At the show, attendees will spend four days networking with colleagues and engaging with hot topics such as innovating in today's fast-moving industry, connecting with consumers through meaningful content and promotions, and getting brands ready for the future of retail. To get a free Expo pass, click here! This session in the "Retail Cool" track - Growing Grassroots: Creating an American Brand for the Future will address how partnerships within the community - from educational and entrepreneurial to workforce-related groups - created the "Made in Detroit" Shinola brand, one of the most compelling retail stories in recent years. It brings a fresh perspective on where to shop, how to shop and what to shop for; rapidly changing the consumers' mindset. For Shinola, from its flagship in Midtown Detroit to locations across the U.S. and London, to partnership brands Nordstrom's, Saks, and Barneys, make this retailer "one to watch." Expanding into watches, bikes, and leather goods, Shinola provides the building blocks for next-generation merchants and designers around the Detroit crusade. As well, Ken Nisch will introduce how the "Make-Tailer" movement delivers experiential consumer opportunities created by local artisans, with a focus on how hot cities like Portland, New Orleans and Pittsburgh (along with Detroit), are creating new ways to shop. For more on the session, visit the NRF here. a technology-driven experience. Their one-of-a-kind interactive experience created a visual representation of SleepIQ Technology inside their new 'it' bed. For a short demo of how their biometric data works, check out this brief video presented by Angela Gearhart, Senior Director Store Experience.